Tamarack Shack: Star Quilt Done! 'Check Out the Stars" is now done!! 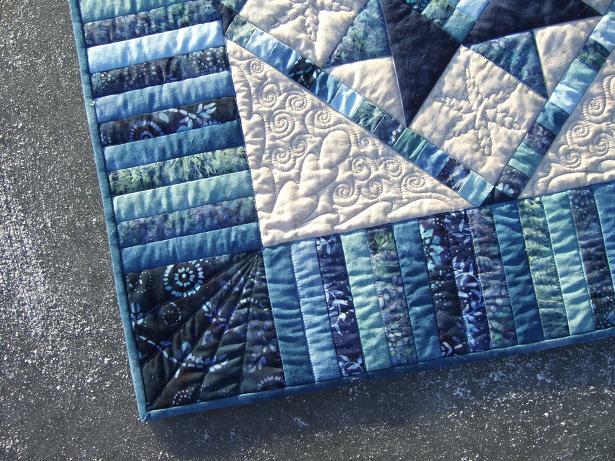 The quilting element that was suggested to me was "SNOWFLAKES"! Of coarse, why didn't I see that. I'm glad I have smart friends :) So I made some cardboard templates and drew out some very 'cookie cutter' style snowflakes with rounded edges. I wanted a whimsical look on my quilt. A tip I learned awhile ago if your looking for a specific motif for a quilting design is to use the term "coloring pages" in your search. For example, I searched "snowflake coloring pages" in Google Images and got a huge selection of snowflake images that are easy to make templates out of. It is cold and very windy out today, with a windchill of -28'c. Froze my hand (camera hand) taking pictures but that was my own fault as I kept finding new places to take pictures. 'Oh it looks good over there and over there...oh and just one more over there!' I had a comment asking if I could do a post on how I photograph quilts outdoors so I might just put that together this month. I used Quilter's Dream Deluxe 100% cotton batting on this quilt as I wanted a heavier quilt with a good loft to the batting. And when I wash the quilt I will get that great heirloom wrinkly look that I want with this one. I stitched in the ditch in the borders and the stars. I used two different Lava threads on top, beige and blue. Bottom Line threads in the bobbin and even matched thread color top and bottom this time as they both blended well with the snow dyed backing. Here it is in it's new spot, MY spot on the couch! 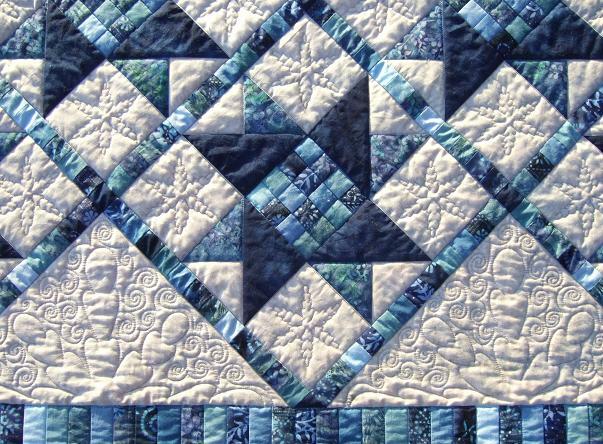 I feel like cuddling up under it today with a cup of tea and just think about what my next quilting project should be. Omg it's gorgeous! I love how you made your templates and the piano key borders gives it a finished look. Thank you for sharing! I bet the backing looks just as great as the front! Absolutely stunning, Kathy!! I love the snowflakes that you made/quilted!!! What a fabulous idea. I can't believe you got it quilted already! Seriously, you rock!! It's fantastic! Glad you are keeping this one for yourself. It's the perfect winter quilt. 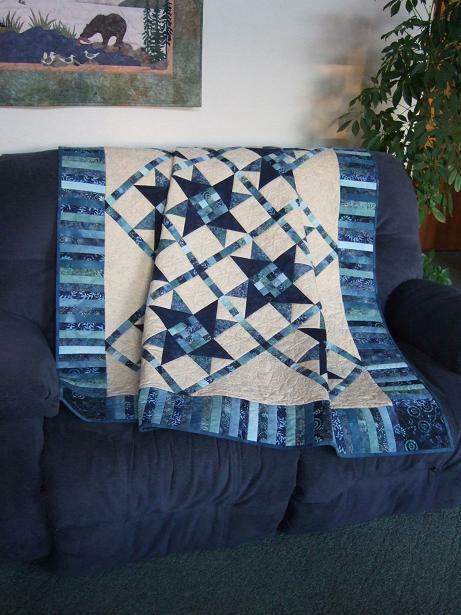 This has to be one of my favorites you've quilted! This is gorgeous! 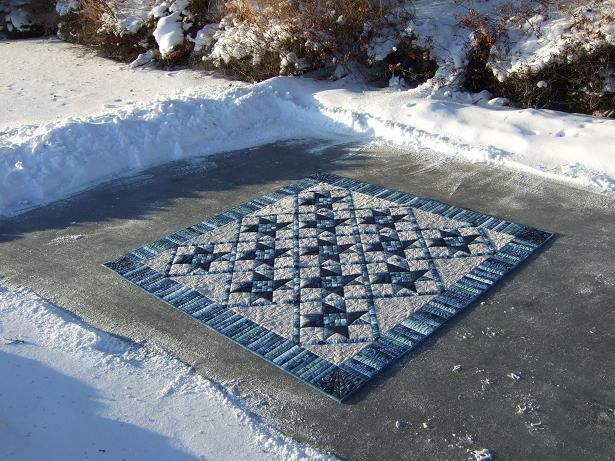 The snowflake quilting is just the thing for this this. Gorgeous....I love how the fabric came out with the snow dyeing. Your quilting was perfect. It is beautiful! Great ideas! I have a great site I use for templates: http://www.supercoloring.com/. The snowflakes are perfect and thanks for the tip on the pattern. Your quiltingis beautiful and inspiring. 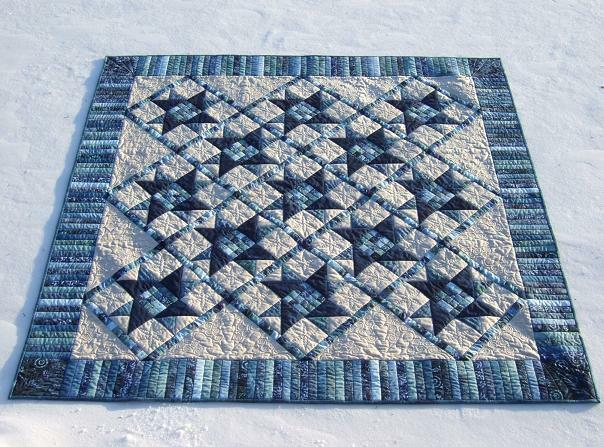 This quilt is so beautiful....the colors make it perfect for the snowflake design. Love the patched centers of the star blocks. You are an inspiration to me. What a beautiful quilt - I love it! I really love the colors of this. I can't get over the star blocks. Such a creative twist on the usual block - Great Job! When I used the higher loft batting then quilted a lot it ended up flat. Mine was hand quilted. What did you do differently. Rosemary - The cotton batting I used is very dense and heavy 6 oz batt, not a fluffy high loft batt. 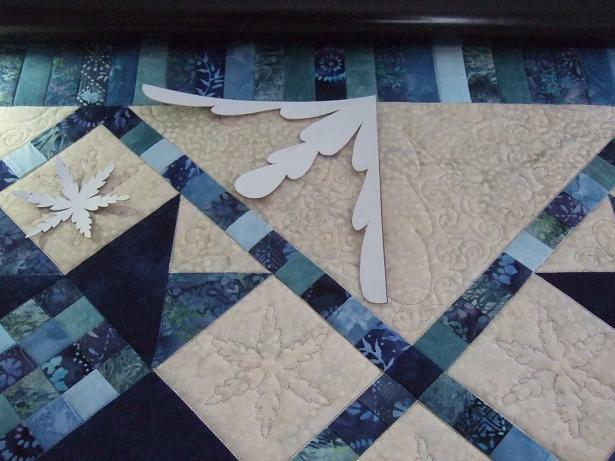 Also when you quilt if you want the texture to show you have to leave open designs, like the snowflakes, so it is not quilted flat. Another trick to avoid a flat quilt is to add two layers of batting, a thinner cotton batt and then lay a fluffier batt over top, this will give you lots of definition to the quilting designs. Oh I just love this quilt! My favourite colour of all time! It is so beautiful! I love how you displayed it for effect outside! Wow this post all of a sudden has gotten 800 views in a few hours from Facebook....can someone share the source of all this traffic with me! I would love to know and thank who shared this on Facebook! Thank you Susie! I left a comment for Benita to thank her for sharing the link. Oh my gosh I just love this quilt. The colors are so rich and warm and the patterns of the snowflakes just make it perfect. What a great idea to use coloring books for inspirations. I absolutely LOVE this quilt. Is the pattern available? Sorry, there is not pattern available for this quilt yet. It was designed by a friend and she hopes to publish it one day. I'll have to bug her again to get working in it! I am going through your older posts again. Today I am on a mission to find both quilt patterns and then quilting designs to use with a stack of blue fabrics. I had already settled on Irish Chain based on some of your quilts. The snowflakes would just be the ticket for the quilting. Your quilt is absolutely gorgeous.